The difference is obvious. To transform the previous file format in to the cntk format it tooks me several minutes and now we can continue with the implementation. First, lets implement simple python function to read the cntk format. For the implementation we are going to use CNTK MinibatchSource, which is specially developed to handle file data. The flowing python code reads the file and return the MinibatchSource. -is_training - Boolean variable which indicates if the data is for training or testing. In case of training the data will be randomized. input_dim, num_label_classes are the numbers of the input features and the output hot vector size. Those two arguments are important in order to properly parse the file. The first method creates the two streams , which are passed as argument in order to create deserializer, and then for minibatchsource creation. The function returns minibatchsource object which the trainer uses for data handling. 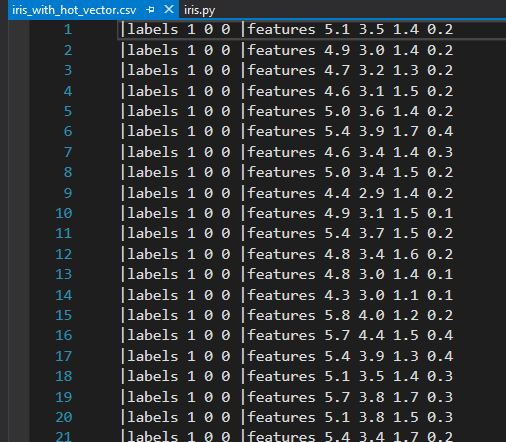 Once that we implemented the data reader, we need the python function for model creation. For the Iris data set we are going to create 4-50-3 feed forward neural network, which consist of one input layer with 4 neurons, one hidden layer with 50 neurons and the output layer with 4 neurons. The hidden layer will contain tanh- activation function. As can be seen Dense function creates the layer where the user has to specify the dimension of the layer, activation function and the input variable. When the hidden layer is created, input variable is set to the input data. The output layer is created for the hidden layer as input. The one more helper function would be showing the progress of the learner. The flowing function takes the three arguments and prints the current status of the trainer. Once we implemented all three functions we can start with CNTK learning on the Iris data. At the beginning, we have to specify some helper variable which we will use later. Create the reader for data batching. Now we need to defined parameters for learning, and showing results. # Map the data streams to the input and labels. 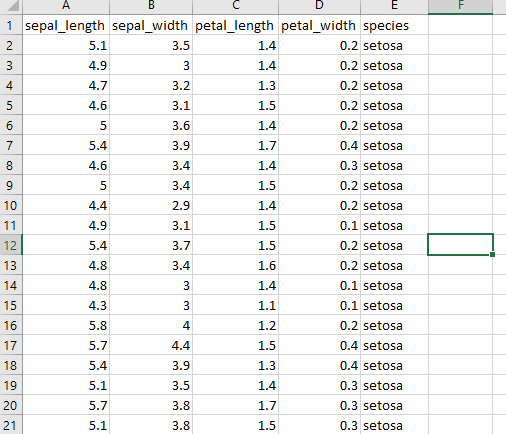 As can be seen the batchsize is set to dataset size which is typical for small data sets. Since we defined minibach to dataset size, the iteration should be very small value since Iris data is very simple and the learner will find good result very fast. Running the trainer looks very simple. For each iteration, the reader load the batch size amount of the data, and pass to the trainer. The trainer performs the learning process using SGD learner, and returns the Loss and the error value for the current iteration. Then we call print function to show the progress of the trainer. Once the learning process completes, we can perform some result presentation. We plot the Loss and Error function converted in to total accuracy of the classifier. The folowing pictures shows those graphs. The last part of the ML procedure is the testing or validating the model. FOr the Iris data set we prepare 20 samples which will be used for the testing. The code i similar to the previous, except we call create_reader with different file name. Then we try to evaluate the model and grab the Loss and error values, and print out. Full sample with python code and data set can be found here.